The iPhone XR features a Liquid Retina display. The third iPhone this year, the iPhone XR, which many thought would be a “cheap" iPhone, has not turned out to be so. It’s not the stripped-down iPhone that the 5C once was. The 2018 device is almost at a par with the iPhone XS, Apple’s flagship product, which will likely help Apple convince more buyers this time. Display: The most notable changes in this phone are the lack of the second camera on the back and a Liquid Crystal Display (LCD) screen instead of an organic light emitting diode (OLED) screen. This does lead to a noticeable difference in the display quality. The iPhone XS has a much more vibrant and brighter display, though you will spot the difference only if you’ve used an X/XS/XS Max earlier. Its display is also not as beautiful as that of the Samsung Galaxy Note 9. Regardless, the iPhone XR’s display is among the best LCD panels out there. It still has Apple’s TrueTone technology, which adapts colours to ambient lighting. Camera: The lack of the second camera affects the XR’s low light performance, but it’s still better than many phones out there. 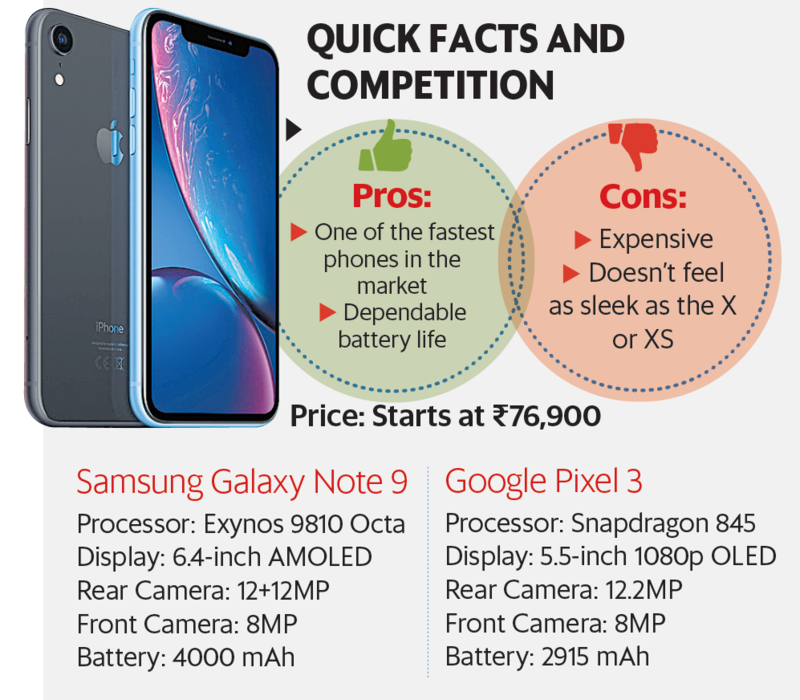 The Pixel 3, Galaxy Note 9 and iPhone XS, though, all remain ahead. Further, the portrait mode can only be used for shooting human subjects now and it is completely software-driven. It has only three modes, instead of five, and optical zooming is missing too. The iPhone XR’s camera does the job for most light conditions though. It takes decent photos in outdoor conditions and though it’s not the best low-light camera, it’s not too bad either. Performance: The primary reason the iPhone XR doesn’t come across as a big compromise is that it is still powered by Apple’s A12 Bionic chipset. The phone is as fast as the XS and retains pretty much all of its features, including Face ID, which is dependable and fast. The iPhone XR can also take advantage of Apple’s machine learning and augmented reality features. Verdict: While this may not be the best iPhone you can buy or a “cheap" iPhone, it’s still the best value Apple has ever offered. It has a modern design, a big screen, dependable battery life, decent camera and is one of the fastest phones on the market.